Out walking at the weekend and had the opportunity to take some photos of the ‘dairy distribution’ building, as I’d noticed when driving past most days on my way home, they’d cleared the site. Looks like either redevelopment, or demolition so thought I’d take some photos for posterity..... not that the building has any historic or architectural significance I suppose? This account of the destruction by fire, goes into some detail about the interior of the building, the decoration etc. which mIght be useful in your narrative? https://www.sheffieldhistory.co.uk/forums/uploads/monthly_12_2012/post-11866-0-26249300-1356032935.png It enlarges quite well and is very interesting.... an extract is attached with some of the details. Obviously pre-Tippex days, as the poor lass in the typing pool couldn’t spell ‘Thornton Road’ correctly either? Nice to see list and chain discount pricing. With over 30 years in purchasing of industrial supplies, it was always slightly baffling that we would buy say nuts and bolts at list -25% -10% -73% and in pre-computer days, working out a stock order of 100+ lines was a pain in the backside! The last stretch of Turner’s Hill was always a footpath and some steep steps, as the photo attached and link below: http://www.picturesheffield.com/frontend.php?keywords=Ref_No_increment;EQUALS;s02658&action=zoom&pos=2&id=6299&continueUrl= Granville Street is the Supertram Route, with footpath, all the way from Shrewsbury Road, to City Square Island, where it turns up Commercial Street, across ‘Hammer Bridge’. The footbridge is still open, but the ratings you see in the photo is to stop idiots trying to scale the bridge and jump onto a passing train! The bridge is covered over with wire mesh all the way across, which just adds to the ambience!! Hope this answers the queries? 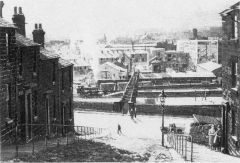 The bridge is most certainly still there (red) and what’s left of Turner’s Hill is a path (blue) and series of steps, which lead from Shrewsbury Road, down to the footpath that was Granville Street. You can see the ‘kink’ in the line of Turner’s Hill and the bridge in the map, which matches the perspective of the photo. I also remember using the bridge to get to the railway station from Granville College, before they opened the ‘new’ station top entrance, after the Supertram line was built. The ‘town’ side of the bridge came out almost at the station entrance, almost unchanged to how I remember it. The building at the top of the hill on Shrewsbury Road was once a sweet shop, wasn’t it? I’m sure that’s the same building where we used to buy 2oz (or if feeling flush a 1/4) of whatever was on offer. The smell of the place was fantastic and once inside was like an olde-worlde kitchen, which I bet the food standards agency would have had a field day with, these days!!! Anyone else remember that sweet shop / factory??? At last! http://www.picturesheffield.com/frontend.php?keywords=Ref_No_increment;EQUALS;s17876&pos=100&action=zoom&id=20472 http://www.picturesheffield.com/frontend.php?keywords=Ref_No_increment;EQUALS;s17884&pos=127&action=zoom&id=20480 http://www.picturesheffield.com/frontend.php?keywords=Ref_No_increment;EQUALS;s17883&pos=126&action=zoom&id=20479 and today’s view?..... not possible as all but obliterated by Meadowhead roundabout! Nice one @boginspro your suggestion set me off on that line of enquiry! @boginspro have you visited this site? There’s some interesting stuff and occasional references to some Sheffield locations. http://britishpostofficearchitects.weebly.com/ Worth a scan through, over a cuppa and a biscuit! As a buyer for my company in the 80’s, I used to purchase from Steadfast Tools, who used to specialise in screwdrivers, many of which we had own-branded.... https://www.gracesguide.co.uk/J._Stead_and_Co i never realised their origins and I think they were eventually swallowed up by Neill Tools?